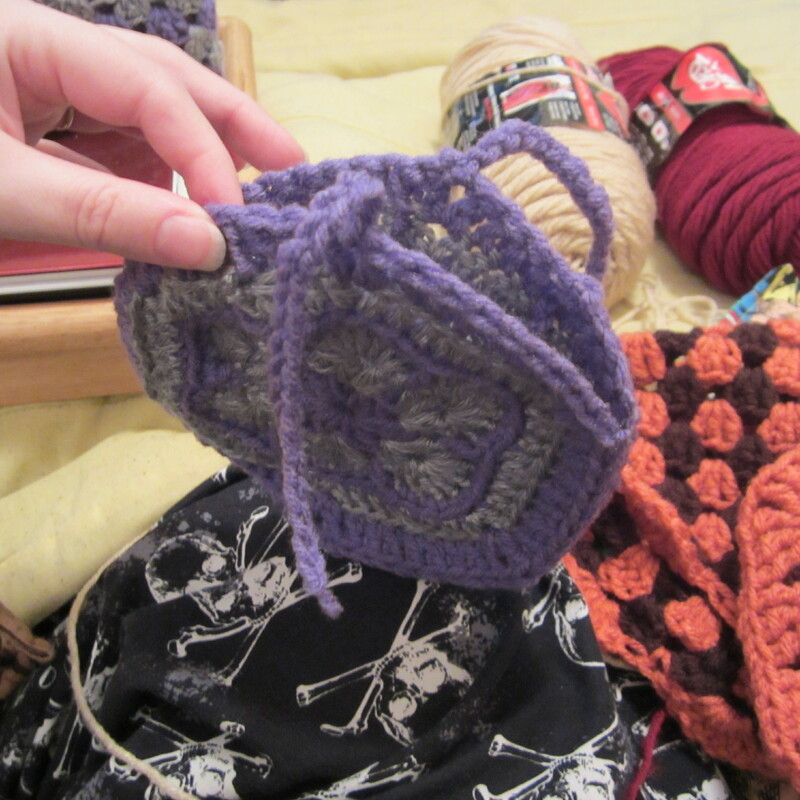 My ghoulz know by now that I’m kind of a lazy crocheter, so when I find a lovely pattern I’d like to try, I’m very likely to make up my own version using a larger hook. I saw a pattern like this on the blog I linked to above, and it is soooooo pretty! 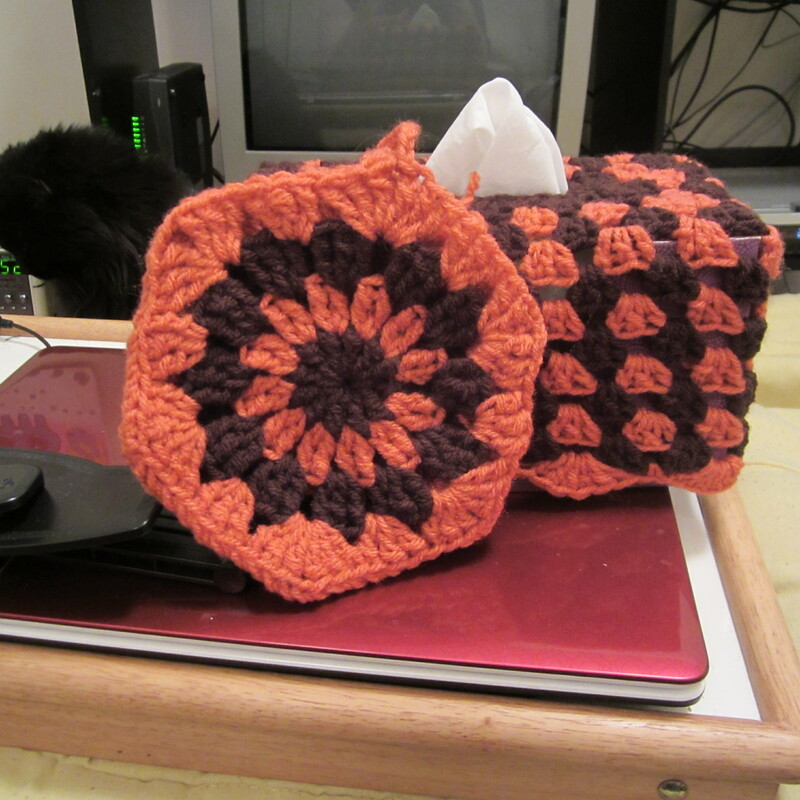 So of course I scanned the pattern and got the basic gist and then created my larger hook version based on that one. You should check out that link if you’re more patient than I, because often times smaller hooks make for better detail. I’m super happy with my quicker version for now, though, because I have many Christmas projects to make!! Size K (6.50 MM) hook and Red Heart super saver yarn. Rnd 2: In the same st as join, (ch 3, 2tr, ch 3, 3tr, ch 3, 3tr), *sk next 2 st, 3dc in next st. Repeat from * 2 more times. Sk next 2 st, (3 tr, ch 3, 3tr, ch 3, 3tr) in next st to create the second side. *sk next 2 st, 3dc in next st. Repeat from * 2 more times. Jn with a sl st in the first tr. Rnd 3: With color B, Jn with a sl st in the corner after where you joined Rnd 2. In this corner, (ch 2, dc, tr, ch 3, tr, 2dc), and in the next corner, (2dc, tr, ch 3, tr, 2dc), 3dc in the space between the fans across to next corner. (2dc, tr, ch 3, tr, 2dc) in each of the two cornerns, then 3dc in the space between the fans across until you’re back to the very first ch-2 where you began the round. Jn with a sl st in the first dc. Rnd 4: With color A, Jn with a sl st in the corner after where you joined Rnd 3. In the corner space, ch 2, *(2dc, tr, ch 3, tr, 2dc). Work 3dc in the open space between the two corners. (2dc, tr, ch 3, tr, 2dc) in next corner space. 3dc in each space between the fans across to the next corner. Repeat from * and jn with a sl st in first dc. Rnd 5: With color B, Jn in any space between the fans that is not a corner, (ch 2, 2dc) in same space. Work 3tr in every corner and 3dc in the spaces around. Jn with a sl st in the first dc. Rnds 6-12: Varying colors in each round, 3dc in each space between the fans. Jn each rnd with a sl st in first dc. Rnd 13: (Skirt round.) Jn chosen color with a sl st in any space between fans. Ch 2, 5dc in same space. (Sc in next space, 6dc in next space) around. Jn with a sl st in first dc. Fasten off and weave in ends. 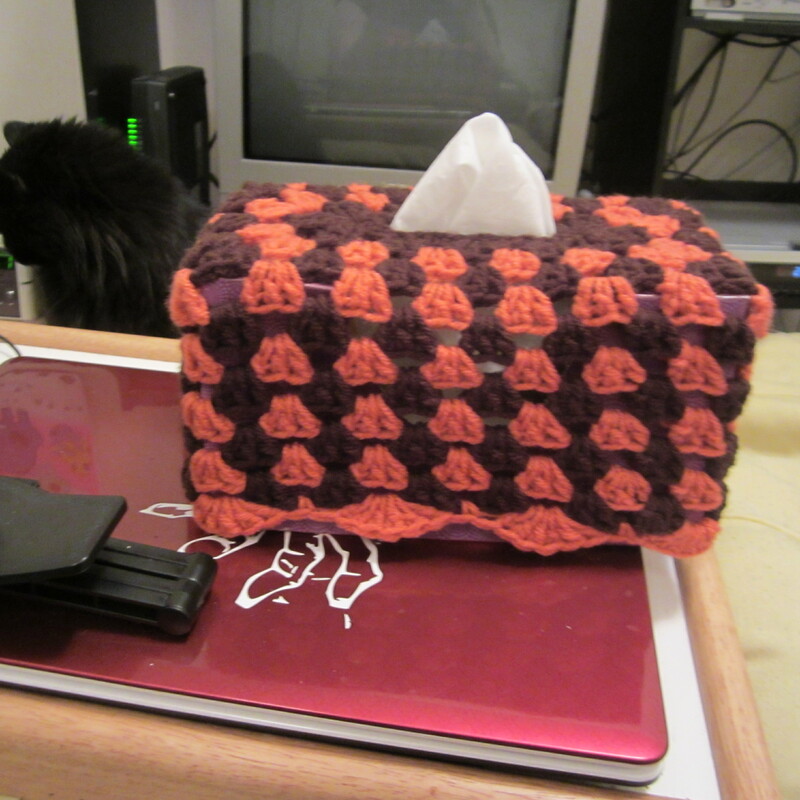 I also made a matching ice pack cozy to go along with the tissue box cozy. 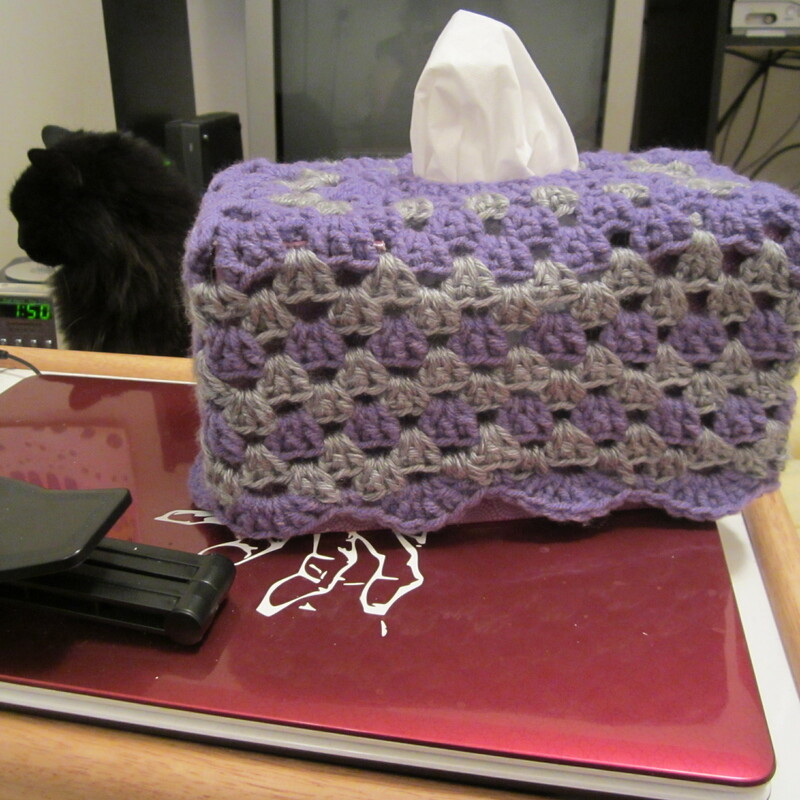 I got the FREE pattern here, and I used a size K hook to make it, made two of them, and then sewed them together all except for the top so you can stick ice into a sandwich baggie and slide it right in there. I used two simple chains on the top to tie it together to keep the ice pack inside. 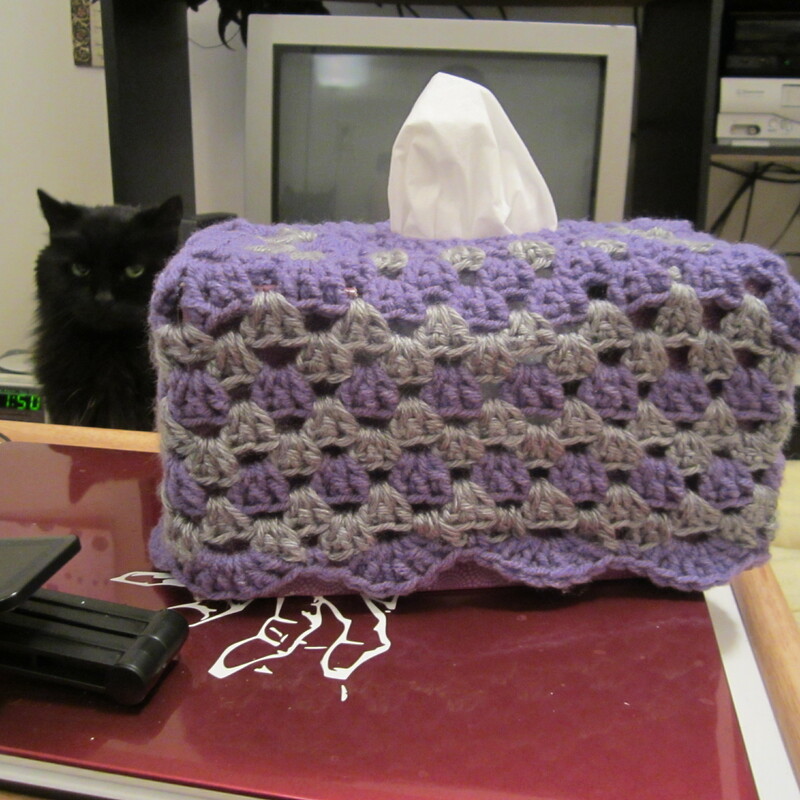 This entry was posted in Uncategorized and tagged box, box cover, Christmas, cover, cozy, crochet, fan stitch, Free Pattern, gift, hexagon, ice cozy, ice pack, idea, pattern, tissue, tissue cozy. Bookmark the permalink. Hehehe! She’s so helpful! Right there to pretend to ignore me. She was wishing I’d stop taking pictures and lean back, put the lap top on my lap, and let her curl up on my chest so she could snuggle and I could type around her while she purrs really loud in my ear. We make a great team!